We are an experienced paranormal research and investigational team based in the Windsor-Essex County Region. We engage in private investigations with expertise, objectiveness, discretion, open mindedness and the latest scientific equipment aimed at studying and measuring all forms of paranormal activity. 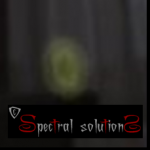 Spectral Solutions is always seeking to increase our knowledge in regards to the paranormal as well as learning and applying scientific methods aimed at debunking and/or accounting for outside interference which may hinder attempts to gain the truth for you, our clients. We also delight in sharing our passion through public hunts and seminars as a way of offering the community the means to get involved and become educated, not only in regard to the paranormal, but also in the rich history of our area. Spectral Solution’s investigation-al services are 100% free of charge. We do not doctor or manipulate any evidence we capture or present on our website, or to our clients. Our main goal is to find the truth and to help put peoples minds at ease. We vow to present all possible evidence in an unbiased manner. We guarantee our evidence will NEVER be tampered with as a way to produce false findings or readings. We cover all areas of the paranormal (ghosts & hauntings, demonology, cryptozoology, psychical research, etc.). If you feel that you are experiencing any paranormal activity please feel free to contact us.